As of this evening, the first stage of coding is now complete. We will be contacting the remainder of our Alpha testers tomorrow to invite them to start testing the service - and thanking them for being patient. We have been bug fixing and trying to break the system for the last two weeks and it is now fairly robust. The Beta launch date is pencilled in for 5th May. We only thought up carrytheone in February so it hasn't taken too long to get to this point! Fingers crossed that the Alpha Testing goes smoothly - otherwise we will have a lot of late nights between now and launch! There's been a bit of tooing and froing between Duane Jackson, CEO of Kashflow, and Dennis Howlett - a blogger who regularly writes about accountancy software. Dennis is also alleged to be a major shareholder in KashFlow competitor, FreeAgent Central, although his regular attacks on their competitors (particularly KashFlow) are not on their behalf. At issue was our initially incorrect subscriber numbers for KashFlow. KashFlow has a total of 3,000 paying customers currently on their system and have had 20,000 in total since launch. Duane was helpfully pointing people towards CTO during our pre-launch phase. After all the controversy we had a lot more visitors! Dennis did think we were onto something though: "[carrytheone is]...a good idea and one to be welcomed." But he did go on to say that: "How long carrytheone can survive as a separate entity remains to be seen because in reality, such integrations are features that any competent developer can mimic." - the second is that your average small business would want to pay thousands of pounds in development costs to mimic a service that costs £12 a month. And then what happens if the store owner needs support (at £50 per hour) or bug fixing or a new feature? Just 3 hours of development time and you have already surpassed CTO's annual cost! I have used OSCommerce for many years and always found the lack of functionality for Credit Orders or Exchanges difficult. In the end, we used the "Edit Order" contribution to directly edit an order. But in the process we lost the order history and it went out of sync with our payments. While a better system could and should be built into OSCommerce, at CTO we have defined a semi-automatic process to help. It does assume that you calculate your sales (e.g. for VAT purposes) from Kashflow and not OSCommerce. 1. The customer places an order containing 1 or more items. 2. The customer returns 1 or more items for an exchange. 3. You create a credit note for the original order and then issue a new invoice from within Kashflow for the new item(s). The process uses KashFlows "Assign Advance Payment" functionality to ensure you keep track of how much is owed by you or the customer for any balance. 1. Go to your OSCommerce admin and create a new Order Status called "Exchanged". Once you have logged in, scroll down to the "Credit Notes" section. Configure one of the 3 potential Credit Note triggers for the "Exchanged" order status. You will want to exclude the delivery charge - because typically if a customer is returning a non-faulty item, you will not refund the outward delivery cost. Also exclude the payment - as this is an exchange, you do not want to automatically assign a payment to the credit note - you are holding back the monies paid in order to put them towards the exchanged item. 3. Place a test order on your system. I will keep it simple for now and order one item. If your customer order several items and only wants to exchange one, you will need to manually edit the credit note to remove the items not being returned. 4. Next, we assume that the customer receives the item and realises that the USB mouse won't work on their old laptop and they need the PS2 version instead. They send it back, and on receipt, you change the order status to exchanged. This automatically creates a credit note in Kashflow - excluding the original delivery and does not assign a payment. 5. Next, create a new invoice within KashFlow for the replacement item. In this case, it is the cheaper PS2 mouse. The total including delivery is £77.19 - a bit cheaper than the first order. KashFlow has spotted that this customer is owed £81.59 off their previous invoice. 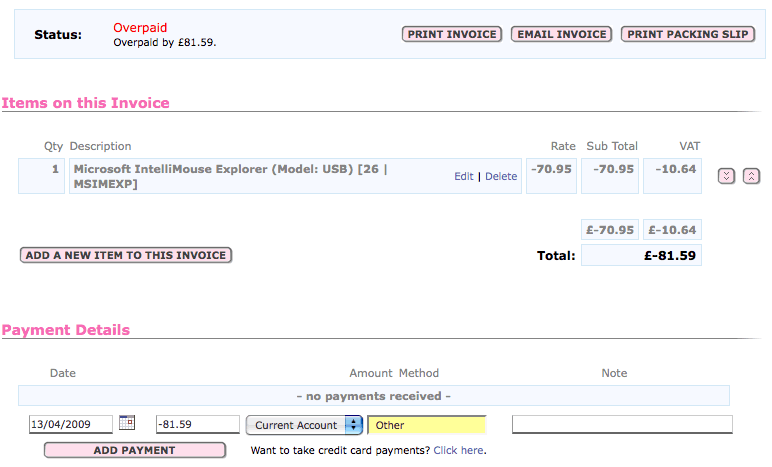 Clicking the button will assign this payment to the new invoice. 6. The final thing we have to do is account for the overpayment by the customer. Unfortunately there isn't an automatic system for this, so I suggest you record it as a transaction under the relevant bank account. Assuming the customer paid via WorldPay, you can do a partial refund through WorldPay for the oustanding amount - £4.40 in this case, recording it as a bank transaction. Alternatively, you could hold onto the money and put it against a future purchase.